Athoris is a cutting-edge, web-based platform designed to provide the ultimate solution for maintenance and repair quote authorization, management and invoicing. Our team utilities extensive industry expertise and experience to provide innovative solutions that allow the vehicle management sector to create and manage essential business processes with maximum efficiency. We embrace an environment of excellence with a distinct focus on partnership and collaboration leading to the delivery of highly advanced, customer-centric solutions. Seamlessly connecting leasing companies, fleet operators, suppliers and repairers online in real-time. Repairer submits the work order to the leasing company for authorization from either their dealer management system or via the Athoris repairer portal. Athoris will automatically validate the work order content against the contract terms and conditions. The Athoris rules engine will evaluate the work order against technical data and lease company settings and provide authorization information. Athoris facilitates, by line item, for automatic or manual authorization or rejection. Full details provided to the repairer electronically. 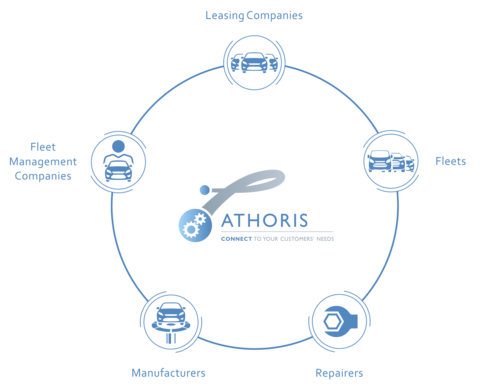 Athoris converts repair detail to lease company terminology and provides output for leasing company systems. Repairer requests Athoris to raise electronic invoice. The electronic invoice is produced by Athoris for authorized items only which is fully reconciled before submission to lease company accounting systems for repairer payment. Integrated technology: Provides fully integrated workflow and data transfer between leasing company/fleet operator and repairer systems. Automatic authorisation: Most SMR quotes can be automatically authorised due to our sophisticated rules engine. Manufacturer source data: Fully integrates data direct from the manufacturer to provide validation for parts, labour and vehicle applicability. Third party data: Integrated third party data from recognised industry sources. Electronic invoicing support: Fully reconciled electronic invoicing posted directly into lease company accounting systems eradicating payment disputes and shortening the payment process. 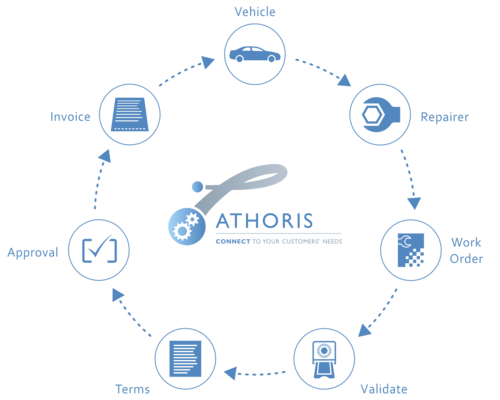 Vehicle history: Athoris uploads existing vehicle history for a complete vehicle record, facilitating automatic authorisation and future remarketing activities. Real-time communication: Fully logged online chat communication stored against every work order for quick query resolution. Complete auditing: All processes fully auditable from the point of creation to invoice submission. Business Intelligence: Comprehensive business intelligence reporting tool providing real insight into your in-life vehicle management.